What Campfire Triggers and Actions are Supported? New Message - Triggers when a new message occurs in Campfire. New Room - Triggers when a new room is added to Campfire. New Message - Send a message to a Campfire room. 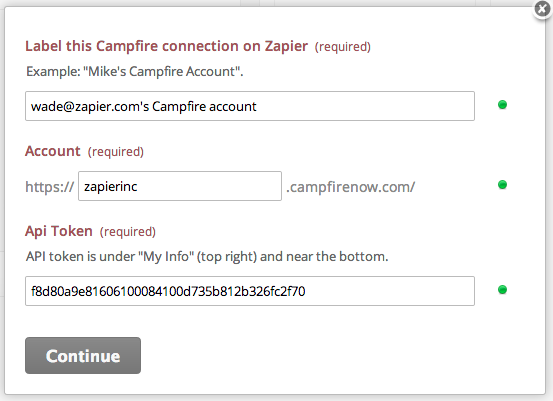 To get started with Campfire, first click to add a Campfire account in your zap. Next you'll need to name your Campfire Account on Zapier, provide your Campfire account name and API Key. The name field is only for identifying a specific Campfire Account in Zapier. This name can be anything you want and is helpful if you are connecting multiple Campfire accounts. The account field is the name of the Campfire instance. This can be found in the subdomain of your Campfire instance. For example, ours is zapierinc which is extracted from https://zapierinc.campfirenow.com/. You can find your Campfire API key under "My Info" (top right) in your Campfire account. Finally, click continue and your Campfire account will be connected to Zapier. This error happens when you've select an invalid room. Click the Room dropdown and select an existing room. 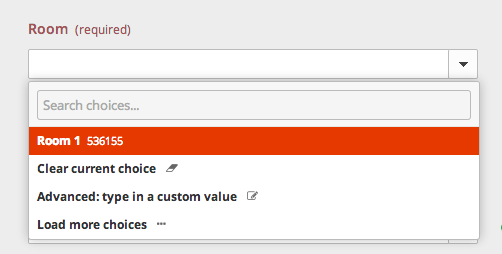 Advanced: custom values aren't supported for Campfire.